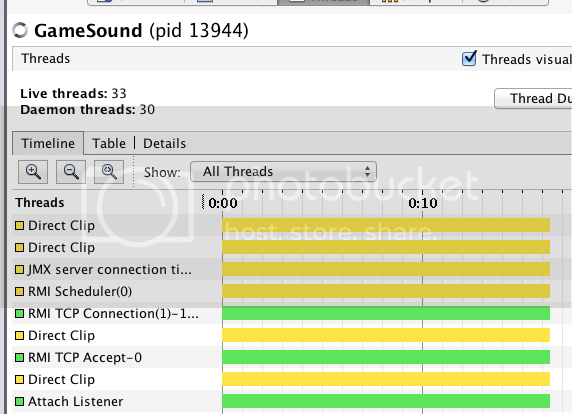 EDIT: After a little Googling, it looks like in fact this is a behaviour of JavaSound (each clip is given its own thread). See here and here for example. SoundSystem allows at most 32 simultaneous clips (which are the backend of each "normal channel" in the JavaSound library plugin), so you should not see more than that unless there is a bug. Probably not much I can do to reduce this thread creation from the library, since this is how JavaSound is written to behave. You could reduce the number of channels using SoundSystemConfig.setNumberNormalChannels() if 32 is too many for whatever reason. I've never tried modifying LWJGL myself, but a quick google search brought up a lot of information that should be helpful. For example, I saw this on the Mincraft forums (Minecraft uses the SoundSystem library, so the info should be relevant). Hey Paul, love the sound system! I have been developing a game and I am using your sound system. It has been working great so far, but I can't seem to find a library for *.m4a files. So far I have *.mp3 *.ogg and *.wav files working. Is there a library out there that I can use to play the *.m4a files? And if not, how might I make a library for a specific file type? Thanks for the awesome sound system, keep it up!